Audio induction loop systems, also called audio-frequency induction loops (AFILS) or hearing loops, provide assistance for the hard of hearing. They comprise of a loop of cable around a designated area, usually a room or a building, which when driven by a dedicated induction loop amplifier fed by an audio signal, generates a magnetic field picked up by a hearing aid thereby generating clear audio directly into the ear. The signal from an audio source is fed into an induction loop amplifier, which amplifies and sets the signal level in the same way as a conventional amplifier. The amplified signal, instead of going to a loudspeaker, is fed to a closed loop of cable that is normally placed around the perimeter of the room. Employing a constant current amplifier ensures the current is maintained at the set level whilst providing a flat frequency response without the need for equalization circuitry. The current flowing through the loop generates a magnetic field that radiates in the space around the loop cable. Any lines of magnetic flux that pass through the telecoil in a receiver, such as a hearing aid, will generate a current in the coil that is then converted back to audio and fed into the listener’s ear. It is important to remember that the magnetic field will ‘bleed’ outside the perimeter of the loop and therefore a loop system cannot be considered confidential. Audio Frequency Induction Loop Systems are designed to work in conjunction with a hearing aid. 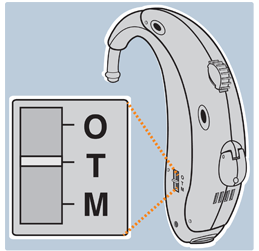 When the switch is in the “T” position the hearing aid microphone is switched off and the user only hears the sound from the induction loop system. All sounds in an area will be heard whether they are the desired sounds or not. The hard of hearing person finds it more difficult to separate the sounds from unwanted background noise. A standard hearing aid will amplify all sounds and although this can assist in hearing, it does not help in an environment where there is significant background noise. An Induction Loop system comprises of a microphone, amplifier and loop of wire. The microphone must be situated close to the speaker as this increases the level of the sound relative to background noise. The amplifier converts this sound into an electric current, which is driven through the loop of wire. The magnetic field from the loop is received by the hearing aid which converts it back to sound for the listener – with the switch in the “T” position. There are currently four main pieces of legislation that service providers and employers must consider in order to avoid discrimination against disabled people, including the hearing impaired. Under the DDA ‘reasonable adjustments’ include the provision of various auxiliary aids including induction loop systems, to enable deaf of hard of hearing people to access goods, facilities or services available to the general public. 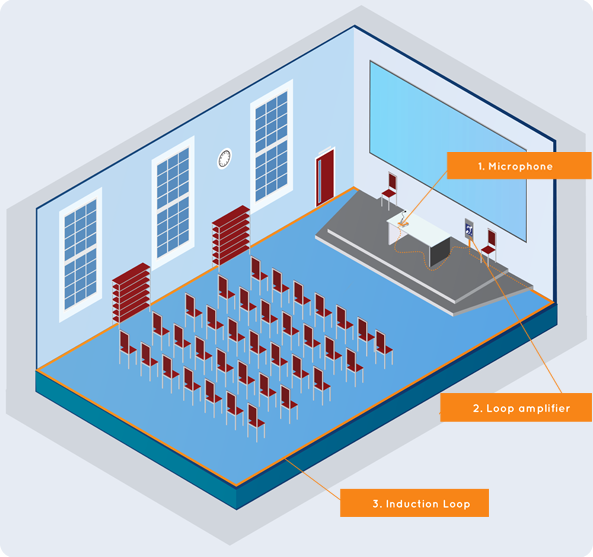 BS8300 states that a “hearing enhancement system, using induction loop, infra-red or radio transmission must be installed in rooms or spaces used for meetings, lectures, classes, performances, spectator sports or films and used at service or reception areas where the background noise level is high or where glazed screens are used”. Areas requiring cover include booking and ticket offices where the customer is separated by the vendor by a glazed screen, reception areas, auditoria and meeting rooms in excess of 100M2. The regulations state that a person with a hearing disability must receive a signal some 20dB above that received by a person with normal hearing. The system should be able to suppress reverberation, audience and other environmental noise.